Ma Croix creates premium quality with affordable prices. Premium relaxed straight twill cargo pants is the perfect cargo that you will find yourself returning to. Features utility cargo pockets with button flap closures. Two back pouch pockets with button flap enclosure - perfect for holding your belongings. Straight leg fit allows enough breathing room for ease of movement in any activity you may be doing. 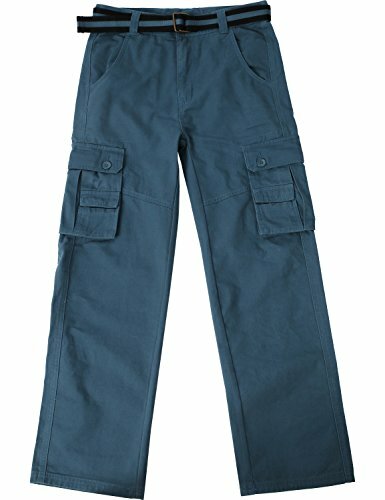 Suitable for work pants, casual wear, camping, outdoor recreation, hiking. Available from sizes 30-44 in colors: stone, khaki, dark blue, olive, gray, khaki, dark gray, and black. Zip fly with button closure and D-ring belt (belt included in purchase). Two front pockets/ Two back pouch pockets with button flap/ Two cargo pockets. Durable double needle stitching to make sure these pants can be worn time and time again. Available from sizes 30-44 in 8 colors. Ma Croix - Make Your Life Simplified. If you have any questions about this product by Ma Croix, contact us by completing and submitting the form below. If you are looking for a specif part number, please include it with your message.